[SatNews] AST Australia (ASTA) has been awarded a long-term contract to supply for the Clough / Helix Joint Venture a complete maritime communication solution for the two-year-old Normand Clough, which is new to the Asia Pacific region. 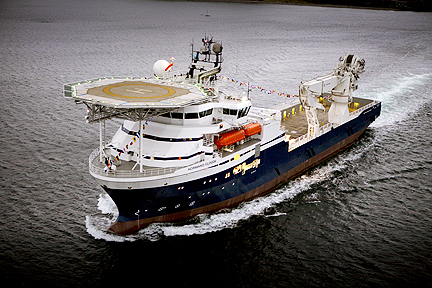 The Normand Clough will provide and offer capabilities unmatched in the region; the aim is to offer up the vessel for work over the complete field life cycle, from development to decommissioning of various oil and gas projects within the region. AST Australia has delivered a complete communication system to allow individual networks onboard for Clough and Helix with bandwidth management between the networks and VoIP systems. ASTA was engaged by Clough Helix JV to create an end-to-end communication solution to allow the Normand Clough to converse easily with their head office located in Perth Western Australia while providing a separate network for the Helix JV users. This was accomplished by connecting the Clough network directly to Clough’s head office located in Perth via an MPLS connection in the Teleport. ASTA included in the system a content management solution that allows the Normand Clough to have total control of their satellite communication links and also prevents unwanted or inappropriate use of the link therefore preserving bandwidth for priority applications and controlling costs. ASTA’s content management solution also allows its unique PipePlus® link aggregation to ensure satellite users seamlessly connects to the least expensive communication link available without any user intervention. This technology can integrate up to 16 separate internet links enabling multiple 3G cards to be used when in range for inexpensive high speed internet access.